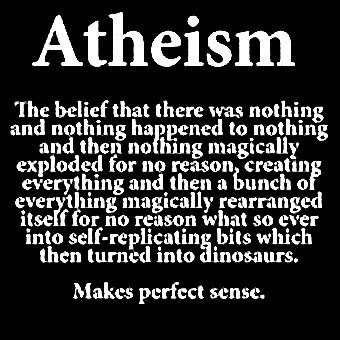 Now not a true exposition on atheism, but still funny none the less. Besides everyone knows that life rode in on the backs of crystals. This is from a friend's facebook wall. Thanks Switch and Josh. Theism. The belief there was always something and then nothing happened for no reason and magically this something made nothing also into something and then magically rearranged into self replicating bits. Also, this isn't atheism. This is cosmology, astronomy, chemistry and biology. Why do you hate science? What has it ever done to you? I don't follow your thought. As what you describe as theism is more rightly called deism. Besides, science cannot logically answer why something is, but it can answer how something acts or reacts. I don't hate science, and I have no idea how you drew such conclusions from a piece of satire that is aimed at poking fun. I think the better question is why do people take unserious things too seriously? Do you understad the concept of categories? Theism is the category with only one required trait. Deism is in the same category, but has certain requirements- it has to be a noninterventionist God. It is like saying humanism and atheism are the same- humanism is included in the category atheism. As for the why questions, the question "Why?" only applies when there is a purpose behind something. When there is, science CAN answer it (see the field of archeology). Where there isn't, science can't answer it. For many phenomena, asking why is pointless- there is NO answer. Why are unicorns hollow? "Why do you hate science" was a mocking question in the vien of "And why do you hate America, sir?" Meanwhile we are talking about religion. You know, the thing people will kill for?